Cooking Class at TenTen Plaza Indonesia: ALL ABOUT TEMPURA. It feels like forever since my last cooking class session. Thanks to IDFB (Indonesian Food Bloggers) and TenTen from Boga Group Company, the same company that owns Pepper Lunch, Bakerzin, Sushi Tei and Paradise Dynasty; few weeks ago it was my honor to attend such delightful invitation. Actually it was my first IDFB event and I got to meet new circle of bloggers, but somehow it lacks some personal introduction and we ended up not interacting with each other. Let's hope that there will be next future event because I'd love to interact more. The event started with some welcoming speeches from both IDFB and TenTen management. 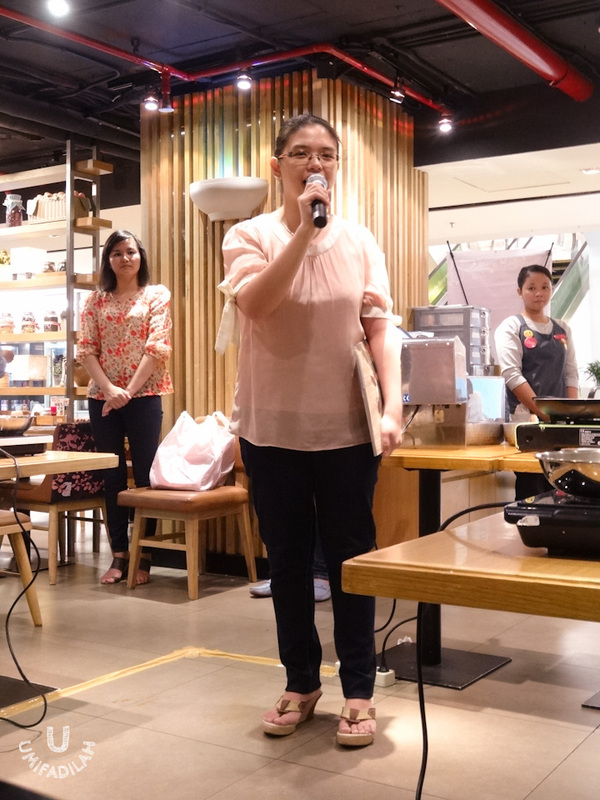 The agenda was pretty simple: speech - cooking class by chef pt.1 - our turn to practice while there was another cooking class by cfeh pt.2 - the real food tasting! Well after all the highlight of that day wasn't Omurice but the Tempura itself. So I wasn't complaining. In fact, everybody was so eager that they all suddenly roll out of their seat to watch the Chef at minimal distance. Like, super close :) There's no holding back for 'em passionate foodie. Use only the best ingredients and respect them. If you're making prawn tempura, it's best to use the huge ones, such as Black Tiger Prawn. Make sure it's fresh and you've cleaned them well, before 'massaging' and diagonally slash its back spine in constant intervals to straighten it up and create beautiful-looking restaurant-quality tempura. If you're making vegetable tempura, make sure to cut everything the same size so that everything's well-cooked at the same time. 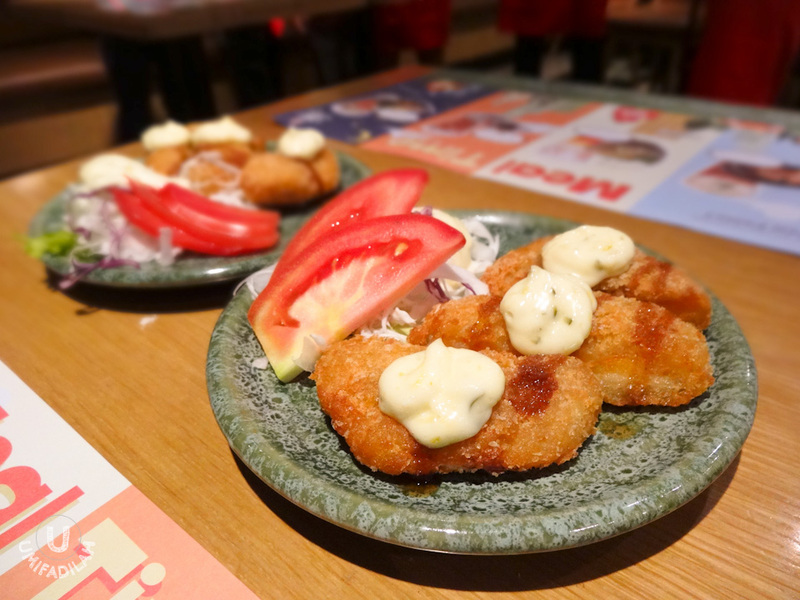 The perfect batter for tempura is achieved by using mix of cold water & a type of flour that already contains egg yolk in it (see below pic for example). Or, you can also substitute with everyday plain flour PLUS adding egg yolk, with composition ratio 500gr flour + 2 egg yolks + 1L cold water. Oil temperature. The most ideal oil temperature for frying tempura is between 160-180C. 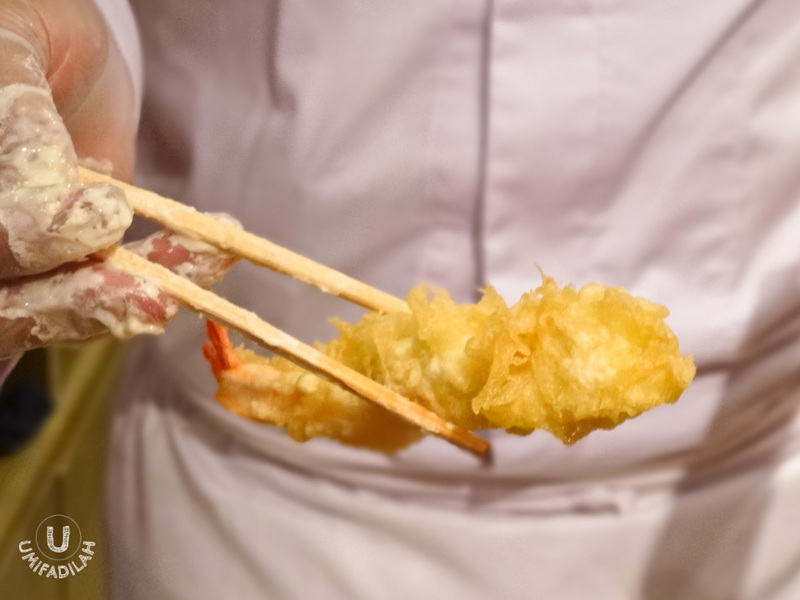 Actually tempura doesn't need deep frying, chef says, as long as the amount of cooking oil is sufficient with at least 10cm height from the bottom of the pan. Crunchy tidbits. Tempura flakes are one of the essential trademark of good tempura. It should be crunchy, flaky, but still has that fluffy, airy inside upon biting. TenTen uses this particular type of tempura flour. 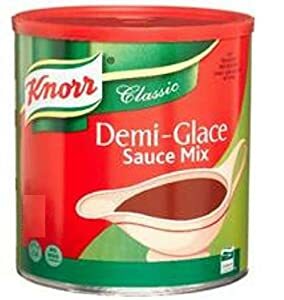 Look out for this brand on your local Asian groceries market, in Jakarta, I've seen it in Kemchik and Food Hall. Tips: the perfect tempura batter uses a type of flour that already contains egg yolk in it, to make sure its fluffy & crisp at the same time. So I teamed up with 3 other friends, Natasha from The Yummy Traveler, Julia from Anak Jajan, and Prawnche from Food Venturer, whilst everyone had 5 people on their team, we only had 4. Oh well, in case you haven't know, both Julia & Natasha are marvelous cooks, so it's great to have them in my team :) Just look at our creation below and tell me it's not restaurant quality! Although we didn't win (yes - what we cooked were all contested), I'm very proud that we've nailed the recipe. See, everything's much better if the ingredients were prepared beforehand. Oh, and by the way, I recall that there was actually session 2 of non-hands-on cooking class: Making Pannacotta. But I personally didn't notice at all as it (magically) went through during post-cooking session. Sorry about that. Our magnificent Tempura Omurice creation. Looks very appetizing, no? Now here comes the most awaited part, lunch time tasting! The only thing I regretted was, picking the wrong menu :| From the very start, the waiter did ask each one of us on what to have for lunch. Kinda forgot that we already tasted SO many tempura during our previous cooking contest, and now we had to eat another Tempura bowl, again. Should have ordered Spicy Beef Kinoko Don instead, because by the time our foods came, I think I've just had fried-thingy overdose, lol. Ebi Yose. Basically shrimp nuggets, but a much tastier version and from the looks on the inside, uses densed shrimp chunks. Topped with TenTen signature mayonnaise & sweet brown sauce, this made a perfect appetizer. Tori Tenbara. Rice bowl topped with tempura of small chicken cubes and mushroom, with white sesame & nori on top. By the time it came to our table, the tempuras weren't crunchy anymore, in fact, already soaked up in its sweet Tendon sauce, so yeah.. just your regular rice bowl. Yep, I have had twice foodtasting in TenTen, and other than its tempura, the winning dish for me is in fact, always their DESSERTS. This time we had Foret Noire and Cookies & Cheese Cup. Foret Noire, the French phrase for black forest, has mousse-like texture and dense strong chocolate flavor, with real black cherry & choco chips hidden inside. The other dessert, has 3 layers of mousse, sponge cheese cake layer, and Oreo crumbles with real piece of biscuit on top. Both desserts were absolutely wonderful, and became the perfect closing to us. Very much recommended. We headed home with full smile and full belly. If one day you feel like craving for GOOD tempura meal in Jakarta, look no more, give it a try.